You see, there comes a time in any given persons life when they must smell any particular fruit. Don’t ask why! You just do. When that time comes, take a whiff of a pear. I don’t care if it’s a candle or the real thing. The real thing wold be preferred though. Can’t have enough pears, I say. Unless you’re full I suppose, then it can’t be helped. Pears don’t offer an overpowering scent. It’s kind of like it’s there, but not there at the same time. Totally sneaking into your nostrils like a ninja, it implants it’s awesome scent before it’s off to fight some crazy battle against the banana warriors. Those guys are freaking vicious! They may or may not have taken my legs from me this one time…wait…they’re still there. Huzzahs! While not the absolute best smelling fruit out there, pears are still cool in the same way that a pile of wood is. Don’t ask me what it means. Because unless you like piles of wood to build awesome contraptions, you won’t understand! 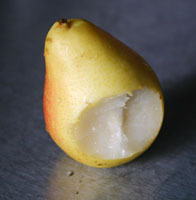 But really, next time you snag a pear and take the first bite, take a big whiff out of one of the most awesome fruits this world has to offer in this not-so-humble Shu’s opinion. Totally promise you won’t regret it! I’ve redone the entire explosion rating thing, so take a gander at what 7.5 out of 10 explosions look like! This entry was posted on December 22, 2009, 1:14 pm and is filed under Smells. You can follow any responses to this entry through RSS 2.0. You can leave a response, or trackback from your own site.